The first phase of round-the-clock works to build a future port in Tuas has crossed the halfway mark, with about 2,000 workers and supervisors on site. When The Straits Times visited the site recently, dredging and reclamation works were in full swing. The world's largest grab dredger, which has a bucket capacity of 200 cubic metres, has been deployed to help with this massive project. By the end of the year, there will be 10 such grab dredgers on site. The use of soil improvement techniques allows the dredged materials from the deepening of basins and nearby fairway, as well as excavated earth obtained from other land construction projects, to be reused as reclamation fill materials for the project. Reusing such materials reduces the quantity of sand fill required for reclamation, resulting in fill material cost savings of about $1 billion. As of Sept 21, 121 of a total of 222 caissons for the first phase have been installed, to form the wharf, a spokesman for the Maritime and Port Authority of Singapore (MPA) said. The caisson, which sits on a foundation on the seabed, is a 28m-high concrete watertight structure - about the height of a 10-storey Housing Board block. Each caisson weighs about 15,000 tonnes, equivalent to the weight of about 8,000 cars stacked together. Using caissons to build the wharf structure is faster than traditional methods like piling. 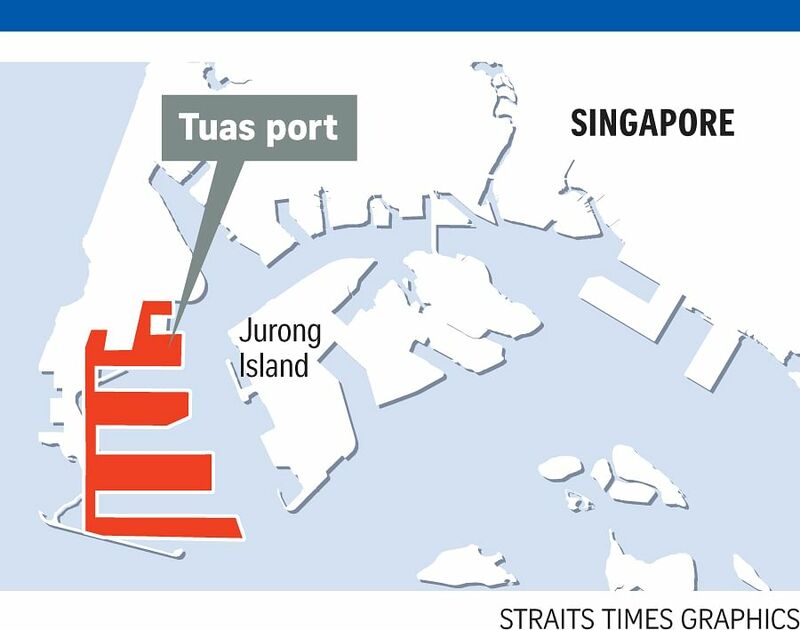 In all, 8.6km of caissons will have to be constructed under Phase 1 of the Tuas port project, which aims to grow the Singapore port amid competition from other regional and global ports. An MPA spokesman said that Phase 1 - of four phases - was on schedule and will be completed by 2021 with the land leased to the terminal operator from the first quarter of 2019. The new Tuas port - which will be twice the size of Ang Mo Kio town - will be opened progressively from 2021. When fully completed by 2040, it will be able to handle up to 65 million twenty-foot equivalent units of cargo a year, more than double what the port handled last year. The port will eventually house current operations at Pasir Panjang, Tanjong Pagar, Keppel and Brani container terminals. As part of plans to develop Singapore's maritime sector, the International Maritime Centre (IMC) 2030 - a 22-member group set up by MPA last year - has recommended a slew of initiatives, which was unveiled on Friday. Committee chairman Andreas Sohmen-Pao said: "Connectivity, innovation and talent are seen as the best ways to remain responsive to changing conditions, and the report provides action-oriented recommendations to be ready for future challenges and opportunities." The Government will study the recommendations and work with the industry to implement them, said Senior Minister of State for Transport Lam Pin Min.